After a series of exchange of heated tweets, US President Donald Trump finally met with Pope Francis in Rome on Wednesday in part of the President’s tour of world religions. Last year, Trump’s plans to build the Mexican border wall left Francis to say that people who think only of building barriers instead of bridges are “not Christian.” Trump dismissed the comments as “disgraceful” and called the Pope a pawn of the Mexican government. The private meeting between the Pope and Trump lasted for 30 minutes, discussing on everything from healthcare and education to assistance to immigrants and the “promotion of peace,” particularly in the Middle East, according to the Vatican’s vague statement. On the other hand, Trump gifted the pope a first-edition set of writings, including five books, from Martin Luther King Jr. and a piece of granite from the Martin Luther King Jr. Memorial in Washington. In a vague statement, the Vatican said the “cordial discussions” between the Pope and Trump, as well as American and Catholic diplomats, touched on everything from healthcare and education to assistance to immigrants and the “promotion of peace,” particularly in the Middle East, from which the President had just traveled. 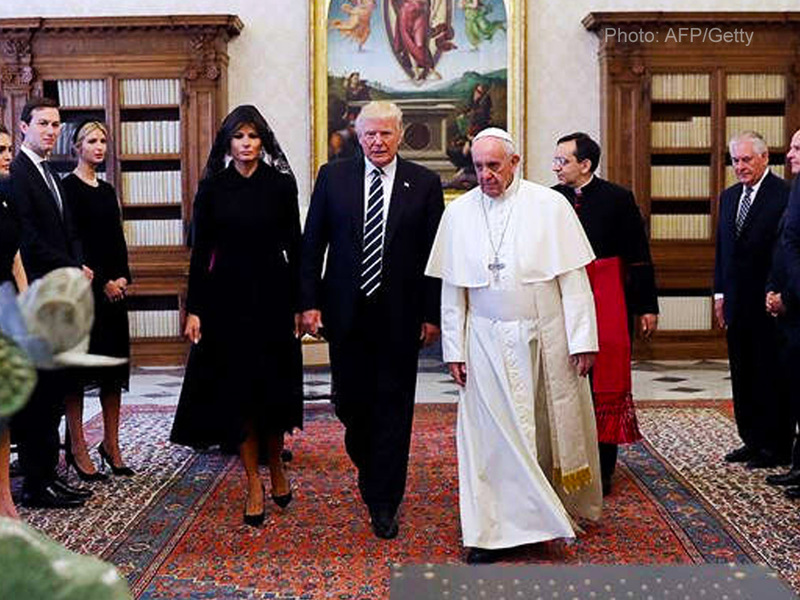 Trump traveled to the Vatican with the first lady Melania Trump, and his daughter Ivanka Trump and her husband Jared Kushner. In his first foreign trip as president, Trump called on Muslims to confront “the crisis of Islamic extremism” in a speech to leaders from 50 Islamic nations in Saudi Arabia on Sunday and visited Jewish and Christian holy sites in Israel.